1st HPR Conference: 2002, Long Beach, USA. 2nd HPR Conference: November 2004, Gifu (near Kyoto), Japan. 3rd HPR Conference: 7-11 April 2007, Matsuyama, Japan. About 100 full-time attendees; audience of about 200 for the one day that all the presentations were made at the Shiki museum. 4th HPR Conference: 22-25 September 2009, Terrigal, Australia. 57 full-time attendees (with over 40 additional part-time attendees). 52 full-time attendees (with 17 additional part-time attendees). The Yuki Teikei Haiku Society Retreats at Asilomar: 2007. 2008 (a haibun). 2010. 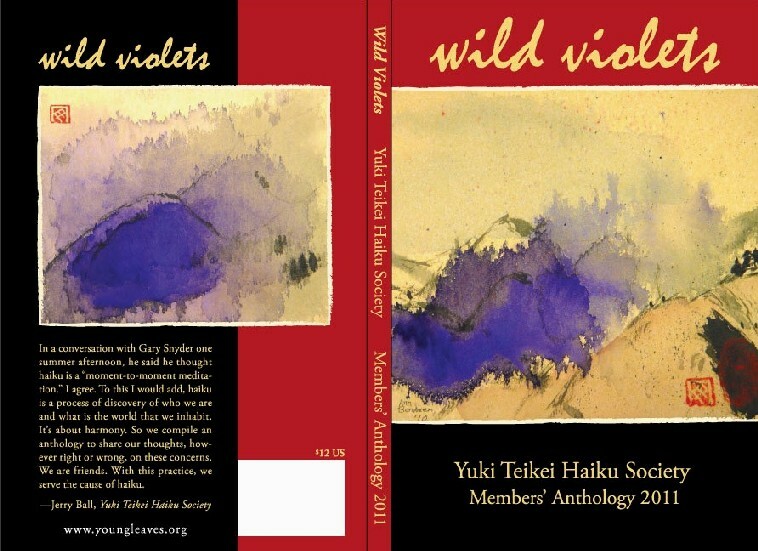 2011 Members' Anthology of the Yuki Teikei Haiku Society. Cover art Copyright © 2011-2015 by Ann Bendixen. Cover layout design and typography Copyright © 2011-2015 by Harry Lafnear. To purchase copies of an anthology, contact Yuki Teikei Haiku Society. Visnja McMaster: Haiku cards and reading competence. Keynote speaker: Dr. Akita Arima (author of Einstein's Century). Organizing committee members: Alison Woolpert, Carol Steele, Fay Aoyagi, Garry Gay, Jerry Ball, Patricia Machmiller, Patrick Gallagher, and Susan Antolin. Presentation committee members: Alison Woolpert, Jerry Ball, Joan Zimmerman, and Patrick Gallagher. Official web site for Haiku Pacific Rim 2012. Welcome and orientation — Jerry Ball and Alison Woolpert. Presentation of HPR conference haiku anthology Caught in the Breeze by its editor Susan Antolin. "Mourning Kiyoko: Landscape and the Haiku Experience" — June Hopper Hymas. "Mrs. Kiyoko Tokutomi and International Haiku Exchange" — Minako Noma. Introduction of Bending Reeds, the 2012 YTHS Members' Anthology (editor Patricia J. Machmiller, designer Judith Morrison Schallberger, cover design Harry Lafnear); including new translations of Dr. Arima's haiku. Haiku Reading by Dr. Akita Arima. Interview with Dr. Akita Arima with Michelle Root-Bernstein. Kukai led by Dr. Akita Arima. Keynote Presentation: "A Poetry Called Haiku — the Reasons Why People Love Haiku" by Dr. Akita Arima. Certificate of Gratitude Presentation (from HSA, HPNC, YT, Haiku Canada, Southern California Haiku Group, and Poetry Center San Jose) to Dr. Akita Arima. Delegate presenters: Jerry Ball, Susan Antolin, Michelle Root-Bernstein, Alison Woolpert, Katherine Munro, Deborah Kolodji, and Patricia Machmiller. "Young Buds" — Makoto Nakanishi. "Power of Haiku, Power of Seasonal Words" — Hana Fujimoto. "Word Choice in Haiku: The Use of Foreign Words" — David Grayson. "'Unexpected Truth' — Ban'ya's Advice to Gendai Poets" — Susan Diridoni. "How to Use Form to Deepen Meaning in English Language Haiku" — Patricia Machmiller. "Calligraphy: A Neglected Artistic Dimension to Haiku" — H. Phillip Hsieh. "A Look at Cutting and Shifting in Haiku" — Susan Antolin. "Moving Haibun" — Genie Nakano. "Unfolding My Wings: . . . Differences between Japanese Tanka and English Tanka" — Linda Galloway. "Robinson Jeffers: The Poet of this Place" — Patrick Gallagher. "A Respective of Haiku and Senryu with Alan Pizzarelli" — Alan Pizzarelli. "ants on the sidewalk: a multimedia celebration of Urban Haiku" — Wendy Wright, Deborah Kolodji, Naia, and Greg Longenecker. "Black Haiku: The Uses of Haiku by African-American Poets" — Charles Trumbull. "Haiku: oooh . . .aaah!" — Neal Whitman. "Haiku Chronicles: A Journey into Multimedia and Podcasting" — Donna Beaver with Alan Pizzerelli. "Illumination with Shadows" [haibun] — Alex Benedict. "Haikuization of Russia" — Zinovay Vayman. "Haibun and Tanka Prose" — Amelia Fielden. Panel Discussion: Dojins' Corner — Jerry Ball and Patricia Machmiller. Panel Discussion: Editors of Modern Haiku, Acorn, Frogpond, and former editor of Gusts and Simply Haiku — Charles Trumbull, Susan Antolin, Michele Root-Bernstein, and Amelia Fielden. Awards: Winners of the Tokutomi Memorial Haiku Contest and others Award Winners — Deborah Kolodji. Introduction to Renku Writing — Patricia J. Machmiller. Renku Writing and Party led by Alan Pizzerelli, Billie Dee, Linda Papanicolaou, Patrick Gallagher, and Patricia Machmiller. Closing ceremony — Roger Abe. Pre-conference picnic (hosted for the conferees by the Yuki Teikei Haiku Society) and ginko (led by Ranger Roger Abe) at Point Lobos State Preserve on the Pacific Coast. Pre- and post-conference coach rides from/to San Francisco, Point Lobos, Pacific Grove, and Carmel. "Creative and Easy Ways of Travel Sketching" with Carolyn Fitz. Haiga Workshop: Art Cards with Linda Papanicolaou and Ann Bendixen. "Scent and Emotional Memory" with Billie Dee. Gentle Yoga at Dawn with Genie Nakano. Haiku database demonstration with Charles Trumbull. Silent Auction of donated items to supplement the conference scholarship fund. The conference haiku anthology Caught in the Breeze (edited by Susan Antolin) contained poems by most of the participants, including J. Zimmerman. Books of Poetry Form. Poetry forms and poets. How to Write Poetry.